Want to listen to Pink Floyd’s May 9, 1977 performance from Oakland, Calif., while waiting for your flight at the airport? Or the Miles Davis Quintet from the Fillmore East on March 7, 1970 on the train during your morning commute? 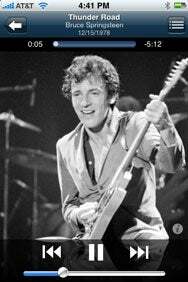 How about The Clash on February 13, 1979 in Cleveland on your next run? Anyone who enjoys live music from the past 40 years would like Wolfgang’s Vault, a Web site whose Concert Vault section offers more than 1,900 free streaming versions of concerts (plus more than 100 interviews) from more than 1,100 artists. The selection runs the gamut from From A Flock of Seagulls to ZZ Top (including, in between, such artists as AC/DC, Al DiMeola, B.B. King, Barry Manilow, Crowded House, Dizzy Gillespie, Genesis, Hugh Masekela, John Lennon, Linda Ronstadt, Men at Work, Merle Haggard, Neil Young, Patti Smith, Queen, Roxy Music, and Stray Cats). The Web site is named for legendary concert promoter Bill Graham (nee Wolfgang Grajonca), whose Bill Graham Presents archives were purchased to make up the bulk of the available material. (Radio fans will also be happy to find content from the King Biscuit Flower Hour.) And now the free Concert Vault app lets you listen to all those great bits of history from the comfort of your iPhone or iPod touch. The first time you launch Concert Vault, you’ll need to register for a free account (or, if you already have an account on the Web site, enter your login information). 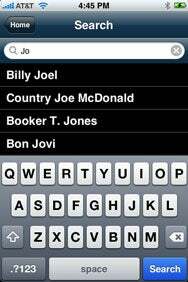 Concert Finder: A live search feature helps you find concerts to listen to—even if it behaves strangely at times. You can find concerts using the Artist Search function option, which gives you live search capabilities based on the letters you enter. It works in a slightly odd way, showing results for the letters you choose that appear in that order at the beginning of any word in an artist name—type the letters D and O, for example, and you’ll see Doc Watson, but also Derek and the Dominos—but it is a nice way to you seek out shows from bands you like. There’s also a New Releases button showing you the latest additions to the streaming library, and a Most Played button that brings up the most popular shows with all Concert Vault listeners. (Frank Zappa’s Halloween 1977 show currently holds the top spot.) You can also access playlists of songs from different concerts, or your favorite shows to listen to again and again, but unfortunately there’s no way to pick items from your iPhone or iPod touch—you must do so via the Web site, and that info will show up in the app. Who’s the Boss: The music player acts a lot like the built-in iPod app. Playing a concert acts very much like listening to an album on your iPhone or iPod touch. You get controls to pause the music or move to the previous or next track, and the upper right corner has the same button that flips the display from the currently playing track to the list of songs in the concert. (Unlike with local files, you can’t scrub through songs, however.) There’s also a small info button in the lower right corner that, when tapped, shows you more information about that particular concert (city, lineup, show notes) as well as general info about the artist. Most concerts also feature cover art of the artist or band while songs play. There’s also a Vault Radio button that lets you listen to premade playlists of songs from the different collections. All the concerts seem to be soundboard or pre-FM recordings, although the quality varies a little from show to show (and purists should know that most of the concerts are not complete shows). But what I found very impressive was how well the app worked with different data signals. The app touts “advanced automatic bandwidth detection and stream adjustment” in its support for Wi-Fi, 3G, and EDGE connections, and I found the results excellent. Although it takes longer to load data and buffer songs using EDGE than 3G or Wi-Fi, the sound quality when listening to three streams of the same song on the different connections was pretty much the same. All in all, if you’re a fan of classic concerts, Concert Vault is a great way to listen to them when you’re out and about. Concert Vault is compatible with any iPhone or iPod touch running the iPhone 2.1 software update.